APHRODITE Beach Hotel is the operator of the websites aphroditebeachhotel.com and aphrodite-beachhotel.com (hereinafter collectively referred to as the “website”) and is thus responsible for the collection, processing and use of your personal data. The use of the internet pages of the Aphrodite Beach Hotel is possible without any indication of personal data; however, if you as a data subject want to use special enterprise services via our website, processing of personal data could become necessary. The processing of personal data, such as the name, address, e-mail address, or telephone number of a data subject shall always be in line with the General Data Protection Regulation (GDPR), and in accordance with the country-specific data protection regulations applicable to the Aphrodite Beach Hotel located in Cyprus. As the controller, the Aphrodite Beach Hotel has implemented numerous technical and organizational measures to ensure protection of personal data processed through this website. However, internet-based data transmissions may in principle have security gaps, so absolute protection may not be guaranteed. For this reason, every data subject is free to transfer personal data to us via alternative means, e.g. by telephone. We take the subject of data protection seriously and ensure appropriate security. Kindly take note of the following information so that you know what personal data we collect from you and for which purposes we use this data. You may visit our websites and inform yourself about our services without disclosing to us who you are. As with any connection with a web server, the server of our web hosting provider records and temporarily stores certain technical log data when you visit our website. 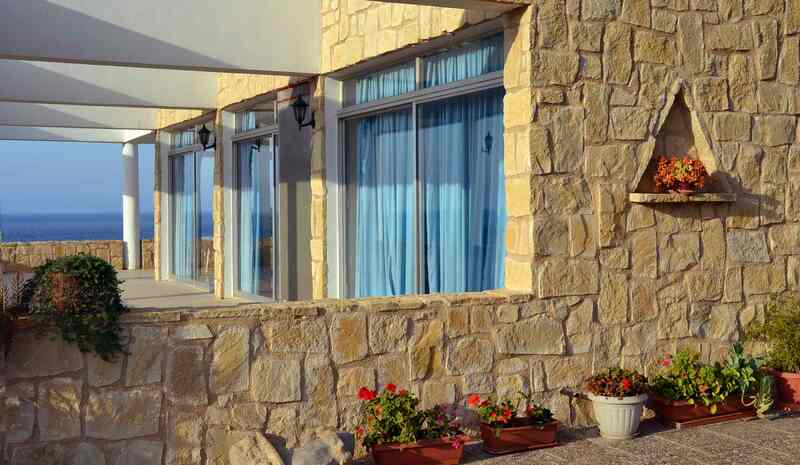 The website of the Aphrodite Beach Hotel collects a series of general data and information when a data subject or automated system calls up the website. This general data and information are stored in the server log files. Collected may be (1) the browser types and versions used, (2) the operating system used by the accessing system, (3) the website from which an accessing system reaches our website (so-called referrers), (4) the sub-websites, (5) the date and time of access to the Internet site, (6) an Internet protocol address (IP address), (7) the Internet service provider of the accessing system, and (8) any other similar data and information that may be used in the event of attacks on our information technology systems. When using these general data and information, the Aphrodite Beach Hotel does not draw any conclusions about the data subject. Rather, this information is needed to (1) deliver the content of our website correctly, (2) optimize the content of our website, (3) ensure the long-term viability of our information technology systems and website technology, and (4) provide law enforcement authorities with the information necessary for criminal prosecution in case of a cyber-attack. Therefore, Aphrodite Beach Hotel analyses anonymously collected data and information statistically, with the aim of increasing the data protection and data security of our enterprise, and to ensure an optimal level of protection for the personal data we process. The anonymous data of the server log files are stored separately from all personal data provided by a data subject. You may, at any time, prevent the setting of cookies through our website by means of a corresponding setting of the internet browser used, and may thus permanently deny the setting of cookies. Furthermore, already set cookies may be deleted at any time via an internet browser or other software programs. If you deactivate cookies in your internet browsers, not all functions of our website may be entirely usable. We advise you not to send credit card information through the contact form. If you contact us by e-mail or via the contact form, the personal data transmitted by you is automatically stored. There is no transfer of this personal data to third parties. On this website, we have integrated components of the enterprise Facebook. The operating company of Facebook is Facebook, Inc., 1 Hacker Way, Menlo Park, CA 94025, United States. Facebook Ireland Ltd., 4 Grand Canal Square, Grand Canal Harbour, Dublin 2, Ireland is the data protection representative for the European Economic Area and Switzerland. The data protection guideline published by Facebook, which is available at https://facebook.com/about/privacy/, provides information about the collection, processing and use of personal data by Facebook. In addition, it is explained there what setting options Facebook offers to protect the privacy of the data subject. In addition, different configuration options are made available to allow the elimination of data transmission to Facebook. These applications may be used by the data subject to eliminate a data transmission to Facebook. Facebook always receives, through the Facebook component, information about a visit to our website by the data subject, whenever the data subject is logged in at the same time on Facebook during the time of the call-up to our website. This occurs regardless of whether the data subject clicks on the Facebook component or not. If such a transmission of information to Facebook is not desirable for the data subject, then he or she may prevent this by logging off from their Facebook account before a call-up to our website is made. Communication with you, either through the website or through email-based communication with you involves Microsoft’s Outlook.com services. You shall have the right granted by the European legislator to withdraw his or her consent to processing of his or her personal data at any time. If you wish to exercise the right to withdraw the consent, you may, at any time, contact any employee of the Aphrodite Beach Hotel. Legal retention obligations are based on accounting and on tax provisions. Pursuant to these provisions, business communications, agreements entered into and accounting records must be retained for up to 10 years. If we no longer require this data to perform services for you, the data will be blocked. This means that the data may then only be used for accounting and tax purposes.